Whenever I fish a new river for steelhead I consider a number of factors before even casting. Color of water; range between pools and riffles; streamside canopy; size of river; dominant riverbed material; historic fishery; and access routes; these are all elements in a day's success and pleasure on our B.C. steelhead rivers. Over the years I have found that while fish holding locations are the one constant while steelheading, it is these other factors that dictate my success and pleasure on a new river. In this two part article I will first look at water color, what I consider is the most important factor, and it's effect on winter steelhead fishing. In my next article I will look at some of the other factors I have listed above and how they too impact the winter steelheader. The color of river water creates a number of interesting challenges for the steelheader. It affects fish location and angler casting locations and wading. But, above all else, the water color, that day, determines lure selection and principle presentation used. your home river. For the lure fisher, this is the color that demands the use of any bright lure whether it be a stream spinner or a bottom bouncing drifter. 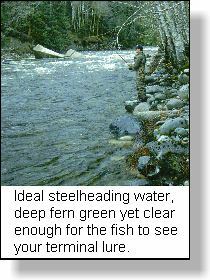 In this deep green water steelhead are capable of seeing most offerings well before they reach the area where the fish rests. 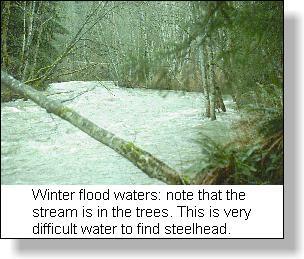 Winter steelhead are not active fish. It is rare that they will actively move from their resting position to take a steelheader's offering. Most steelhead will never take any offering regardless of presentation. Steelheaders need to recognize this fact and hunt for those 'catchables' that will strike. Presentations must be near and even bouncing along the bottom of the stream. In most cases the 'catchables' will take the offering with the least expenditure of energy; that is, they will simply open their mouth and take the offering as it passes in front of them. Fish the bottom - ALWAYS! That is a truism of steelhead angling. Some rivers have a rich tea color as a result of tannin leaching from evergreens in their watersheds. 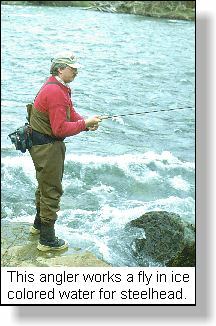 In these waters the fly fisher needs to use large bright attractor flies because the tannin dulls color. The lure fisher also requires bright lures which will attract the steelhead's attention. In tannin waters I often fish with magnum sized rubber latex lures like the Gooey-bob, or large fluorescent orange Spin-&-Glows because they show up so well. In these tannin waters the fly fisher should use large flies, those with dominant silver and fluorescent patterns. Some rivers have heavy clay deposits in their watersheds. In heavy runoff times these waters become colloidal, suspending the clay sediment in the water like cream in coffee. Because winter steelhead rest where there is light, in these cream colored streams they can be found right at the beach, in calf deep water where you would normally wade. Use bright lures and fly patterns and make a habit to drift and swing them through the shallow reaches particularly where there are overhanging boughs which give the fish added security. 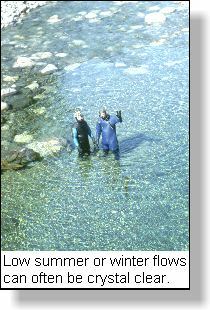 Clear water is a most common occurrence in coastal rivers during the winter due to cold 'snaps' in mountain watersheds. Clear means clear! Those anglers who swim rivers with face masks know that when the river is clear, underwater pebbles can be counted on the far beach, as can the scales on individual steelhead, or, the toe of a wader carelessly put in the water. Small dark flies or small imitation eggs are the most effective producers in this circumstance; fished on the bottom. Depending upon the weather when you are fishing, river levels can be high or low, muddy colored, clear, or in between; usually in between has been my experience when I am searching out new waters. Go prepared with a kit capable of fishing all conditions even if it does weigh the proverbial 'ton'. pools. But, should the waters be low and clear cast to the whitewater sections behind instream boulders or at the head of a pool where steelhead will seek for it's added security. Water color is unique to every river system. Each river's unique race of winter steelhead has evolved to capitalize on the color of that watershed to give them the greatest sense of safety and the greatest opportunity to reach the spawning beds. The steelheader can greatly increase his pleasure and success in new waters if he studies that water carefully before selecting his tackle and casting. Part 2: Other factors to consider when steelheading a new river.